This article first appeared here on ForeignPolicy.com on January 16, 2019. Should the United States recognize Israeli sovereignty over the Golan Heights? The question has come up in the last few weeks, because Israel is having an election in April. Prime Minister Benjamin Netanyahu has reportedly been lobbying the Trump administration on the idea of formally acknowledging Israel’s 1981 annexation of Syrian territory. There’s plenty of reason to suspect this diplomatic gambit is motivated primarily by Netanyahu’s hope for domestic political gain as he faces re-election under the pall of possible indictment. But the U.S.-Israeli negotiations are a sideshow for a more fundamental strategic reason. Whether Washington recognizes Israel’s annexation or not, the Israelis are never withdrawing from the Golan Heights—nor should they. Moreover, the Israelis haven’t always even sought U.S. recognition of the Golan Heights as part of Israel. In the 1990s, Israel worked pretty hard along with American diplomats to fashion agreements to return the Golan to Syria. As recently as 2010, the Israelis were negotiating indirectly with the Syrians through the United States. Only a few years earlier, the Turkish government was facilitating indirect talks between then-Israeli Prime Minister Ehud Olmert and Syrian President Bashar al-Assad. Although Netanyahu’s office denied it, the 2010 proposal for peace included a withdrawal from the Golan Heights, though perhaps not all of it. 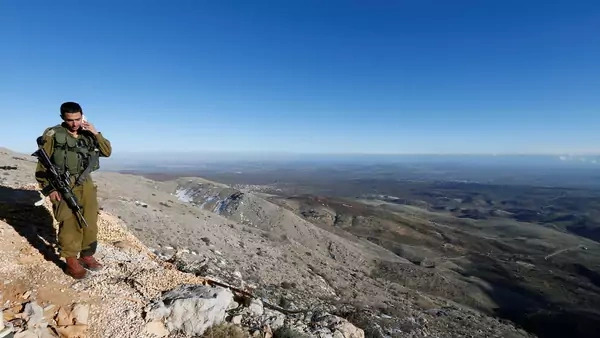 The Israeli interest in trading away the Golan Heights was predicated on a belief—or wishful thinking—that a peace treaty would break the Syria-Iran-Hezbollah axis. It makes sense on paper, but peeling the Syrians from Iran and Hezbollah was never going to work. Bashar al-Assad’s father, Hafez al-Assad, was at best a grudging participant in the peace process of the 1990s. Syrian diplomats showed up for talks, but they never actually negotiated much. In his book The Arab Center: The Promise of Moderation, former Jordanian Foreign Minister Marwan Muasher recounts how the Syrians sought to obstruct regional peace rather than contribute to it. It is true that Hafez al-Assad invoked “peace of the brave,” but getting around the table for a three-way handshake with a U.S. president and Israeli leader was not the way he did business. Rather, Assad was accommodating enough to keep his enemies at bay—for example, sending Farouk al-Sharaa or some other regime figure to meet Israel’s Ehud Barak—while retaining the means to do his enemies harm, such as, say, facilitating the transfer of weapons to Hezbollah. Bashar’s father was as shrewd as his son is plodding, and as a result there was very little chance that he was going to give up his strategic ally, Iran, and Hezbollah for a deal with Israel. He had seen what happened to his former partner in arms, Egypt’s Anwar Sadat, whose separate peace turned out to be a humiliation only partially salved with copious amounts of U.S. assistance. Sadat also ended up dead. Under these circumstances, it was surprising that Israel—including its much-vaunted security establishment—seemed so eager to give up the Golan Heights. The 1974 disengagement agreement between Israel and Syria provides a kind of legal cover for one important fact: Quiet along the Israeli-Syrian front for the last 45 years is a function not just of the capabilities of the Israel Defense Forces but of the unparalleled advantage the Golan Heights gives Israel’s armed forces. The Golan multiplies Israel’s force in the event of a war, but, more important for Israeli security, the area is an unrivaled intelligence-gathering platform. From its posts atop the Golan Heights, the IDF can look and listen in on the valley below that leads to Damascus, only about 45 miles away. Nothing is foolproof, of course. The Israelis occupied the Golan Heights in 1973 and ran into a lot of trouble when the Syrian attacked on Oct. 6 of that year, but all things being equal, there is no question that holding onto the plateau is superior to withdrawing and the uncertainty of an agreement with the Syrian regime. If it was hard for Hafez al-Assad to come to terms with Israel, it is even harder for Bashar. When the elder Assad died in the summer of 2000, there was considerable speculation that his son would be a reformer, capable of making peace with Israel. This was more wishful thinking. When they were negotiating with the Syrians through Turkey in 2008, the Israelis believed they could trust then-Prime Minister (now President) Recep Tayyip Erdogan to bring the young Syrian leader along and effectively peel him away from the Iranians. For all of Erdogan’s skills and the amount of effort he invested in Syria, the Turkish leader was unable to advance the negotiations. No doubt, Israel’s 2008 Operation Cast Lead—the operational name of its war that year in Gaza—short-circuited the Turkish effort, but there is little reason to believe that the Syrians would be willing to make a deal with Israel. In late January 2011 after Tunisia’s Zine el-Abidine Ben Ali fell and Egypt’s Hosni Mubarak was teetering, Assad declared that an uprising against his regime could not happen in Syria because there was little “divergence” between “policy and the beliefs and interests of the people” in his country. He was incorrect. Popular protest broke out in Syria a few months later. And when the younger Assad proved himself to be a bloody blunderer who put the regime in jeopardy, it was the Iranians who came to the rescue. The Syrian leader now owes his and his regime’s survival in part to Iran, which has sought thus far unsuccessfully to establish a permanent presence on Israel’s border. That shouldn’t matter, though. Iran and its expeditionary force, Hezbollah, are a threat to Israelis security. The Golan Heights is critical to keeping both from achieving their ends. This is the environment in which the idea that the United States should recognize Israel’s annexation has surfaced, which makes it a more compelling case for Netanyahu to make. Still, the status quo in which the United States simply ignores Israel’s absorption of the area is preferable to American recognition, which would result in a messy and counterproductive international debate that will do nothing other than highlight Israel’s original annexation, spurring opposition when previously there was acquiescence. In reality, there is no need for the recognition. Israel is in Golan for its own reasons, and nothing the Trump administration decides will change that.